Creative, bold, and poignant ideas are what I do best. I want to work with you in finding the best solution for your video design needs! My preferred method for developing concepts is to build previsualizations within Unreal Engine. 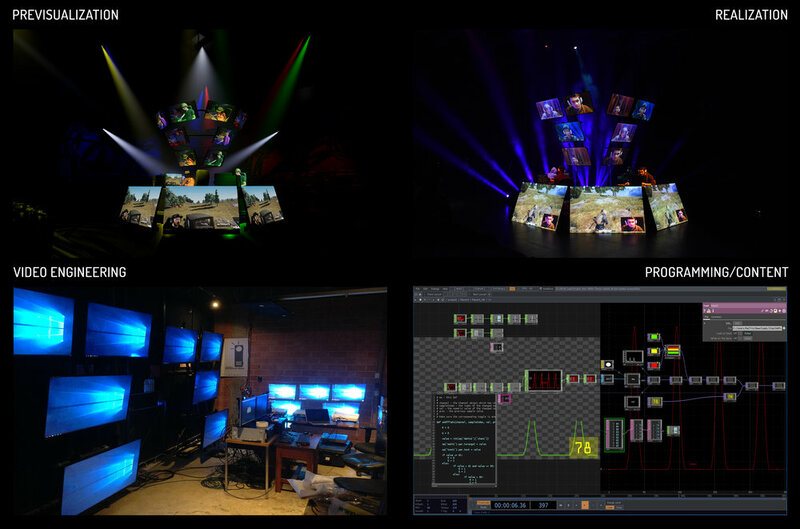 These previsualizations allow teams of collaborators to respond to the design relationships between scenery/lighting and real-time video. Finally, all these previsualizations are available in digitally deliverable formats! I am a problem solver with an insatiable appetite for learning and trying new things. I am excited by the process of taking concepts/ideas and turning them into live experiences! Every video design needs a playback system, video equipment, and a detailed drafting package. Additionally, depending on the needs of a design, it may be necessary to research and develop custom video systems and/or interactivity systems. We will work together to find system solutions that work within your budget! I like to feel the mood, the motion and the rhythm of a live moment so that I can create harmonious content. In live video design, the relationship between video playback systems and the development of content is a symbiotic one. I am comfortable programming and generating content between a myriad of software's including but not limited to: Touchdesigner, Watchout, Disguise, Isadora, Qlab, After Effects, Premiere, Photoshop, Illustrator, Cinema4d and Blender. Additionally, I am familiar with 3D scanning, photogrammetry, video production and 360 video production. I've also begun exploring real-time content creation! Whatever a live moment needs, we can create the perfect content for you!